Wholesaling for $15, the bands come in two options (42mm and 38mm) to match standard Apple watch sizes. Each product also comes with an additional half band to adjust to any size wrist. To round out the look, a matching digital watch face can be downloaded from Watchitude’s website. The official launch for the collection is slated for January 2019 at Children’s Club, but Kassin says a soft launch will occur in August to capitalize on holiday promotions. Looking ahead, the exec says Watchitude will continue its foray into digital with the introduction of a kids’ smart watch along with digital non-slap silicone watches and Bluetooth printed speakers and earbuds in a self-charging printed case. A small collection of girls’ hair accessories are also in the pipeline that complement its prints. Ooh La La, a Kids’ Spa! Some parents demand the best for their beloved offspring—the finest clothing, a private education, etiquette lessons and, just in time for vacation season, they can add spa treatments at the Spa Le Bristol by La Prairie and Kids Club in Paris. 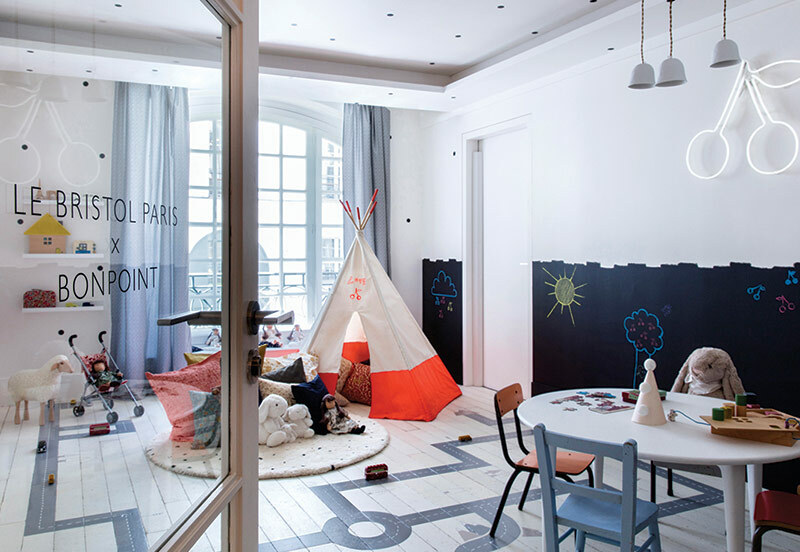 A partnership between Parisian fashion house Bonpoint and Le Bristol Paris, the Kids Club features a stylish play area, complete with Native American teepees, floral patterned cushions, chalkboard walls, electric car tracks, doll houses, books and a menagerie of stuffed animals. In addition, the spa offers five Bonpoint treatments for parents and their children to enjoy together. There’s the Gentle Facial, where children 6 to 12 years old can receive a hydrating facial and scalp massage, and the Tender Massage, where tweens 12 to 16 enjoy a peaceful tandem massage. Each treatment is developed in conjunction with La Prairie using natural, hypoallergenic products suitable for the sensitive, delicate skin of children. Anticipating more than 10,000 buyers from around the world, the show’s three-day agenda is packed (per usual) with catwalk shows, meetings and events that cover the industry from top to bottom. Some special activities include Dsquared2 celebrating five years of its baby line with a prom dance party and a new capsule collection, as well as the “Monnalisa Garden Party” held in the Torrigiani Garden. Catwalk shows include luxury collections of the Apartment area, as well as brands from the more playful KidzFizz section. There will also be a performance by athleisure brands in Pitti Bimbo’s new #Activelab section.